Rhodes or Rhodos, as it is called locally, is one of the Dodecanese Islands which lies just a short distance from the southwestern coast of Asia Minor. Covering an area of about 542 sq. miles the island has a mountain range running its entire length. The fertile valleys are home to many orchards, farms and vineyards. 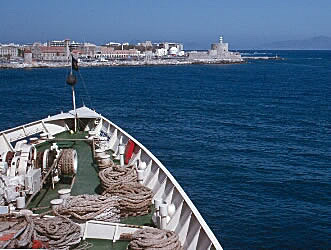 It is better known, however, as the location of one of the Seven Wonders of the Ancient World, the Colossus of Rhodes. The Colossus of Rhodes was a great statue of Apollo and it is said to have straddled an area between two points where ships enter the harbor. Unfortunately nothing remains of it today. While Rhodes is a sizable island we only had the afternoon to enjoy it. There were several excursions that you could sign up for and we selected decided to visit the city of Lindos with its magnificent Acropolis and ruins of the Temple of Athena. Before leaving the boat it was time to enjoy something to eat. While on a cruise ship you may be missing some of the amenities you're accustomed to, like spacious living quarters, a large bath and a king-size bed, but there is definitely one thing you're not hurting for and that is food. The food was plentiful and, better than that, it was good. Not only was it plentiful, it was available virtually around the clock. No matter what time of day or night you could always scrounge something up to eat. No wonder cruises have reputations for adding inches to your waist. 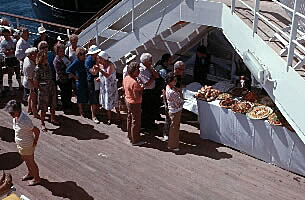 Having eaten we were ready to disembark and enjoy the sights of Rhodes and Lindos. would be developed, which later became the basis for the Roman 's maritime laws. 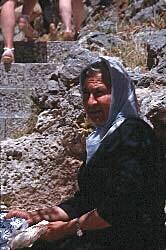 The people of Lindos were also known for their beautiful sculptures. Sculptures that were made of bronze as the local stone was not suitable material. Chares, the artist who created the famous Colossus of Rhodes, was from Lindos. The Acropolis lies atop a massive triangular rock. Tools found during archaeological digs have dated back to 3000 B.C. I'm not sure exactly to what era the ruins existing today date to, probably between 1000 and 500 B.C., but the massive walls that surround the city today are attributed to the Knights of St. John who controlled trade and shipping until 1522. Enough history, let's look at some pictures of the modern day city of Lindos and the Acropolis that lies directly above her. 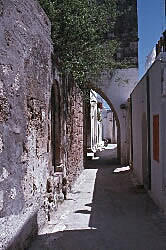 Many of the buildings of modern day Lindos date to the 16th and 17th century and are being restored. Hotels are banned in the city to preserve its historic appearance. Locals offer rooms for tourists to stay and enjoy the sights. 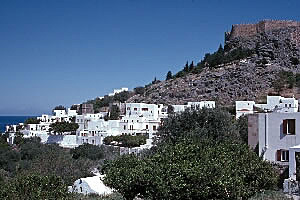 A closer view of the city of Lindos and the Acropolis shows the massive walls built by the Knights of St. John. These walls obstruct the view of the ancient ruins of the Acropolis. The city is a maze of beautiful streets and small alleys. 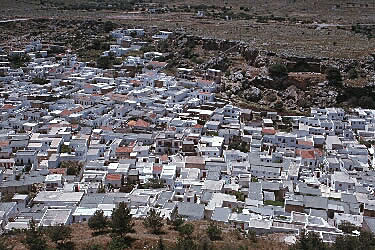 The city of Lindos and its maze of homes. 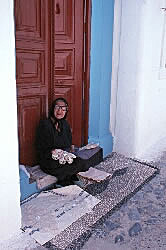 Many of the city's residents make their living from the tourists by selling trinkets from their doorways. Continue to the next page to enjoy some of the photographs of the Acropolis, its ruins and the breathtaking views from the top.